Happy Birth Month to You! Mike has a milestone birthday this year, and what better way to celebrate than with Italian food, wine and scenery? I couldn’t quite get the trip scheduled so that we would be in Italy on the actual date, but then we have never been good at following calendars. In the past, I just used to declare that according to the Mayan calendar, the date was really—-and fill in the blank with whatever date we were celebrating. But then I thought why not start for a new tradition? Instead of Birth Day, why not celebrate Birth Month? Think about it–you would have a full month to schedule that special event. The odds that you could find a day that would allow everyone to attend just increased 30 fold, except, of course, for those born in February. Sorry. It is especially helpful for those of us that left the Homeland (Massachusetts) for the Hinterlands (New Jersey). My family has sorta gotten used to my inability to be calendar bound, although I DO usually get the month right. Anybody ready to join the Birth/Anniversary Month movement? To celebrate Mike’s birth-month, we will be wandering through Tuscany, ending up in Sorrento. This will be our first trip with Grand Circle, a sister company of Overseas Adventure Travel. Although the group is a bit larger than we normally choose, we liked the itinerary, which has us plopped in two towns, each for one week. Another selling point was the number of optional trips, so we can stay with the group, or choose to strike out on our own, should we feel the need. The best part? Our good friends, Shirley and Owen, will be on the tour. We arrive in Rome, then head for a town I never knew existed, and whose name I am probably mispronouncing: Chianciano. 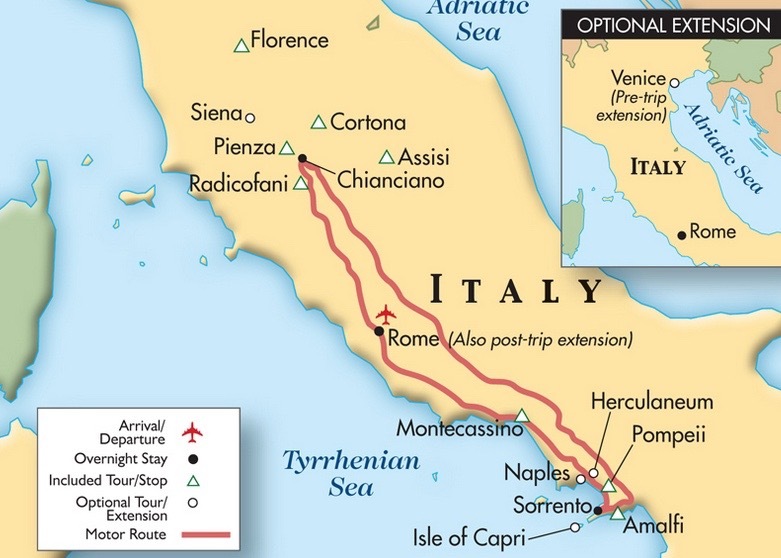 It will be our base for a week, as we explore the other Tuscany towns shown on the map above. Our second week will be in Sorrento, a great base for all of the incredible area attractions. We already received a lovely welcome note from our guide, Anna (pronounced like Donna, without the D) Costes, full of helpful information. She very kindly responded to my questions about our day trip to Florence. We are off to a great start! Pienza remains a Very Favorite. Happy Birth Month to Mike and enjoy every Tuscan moment! Thanks Sammy. I have been so overwhelmed with renovations and my parents’ health issues, it is just now sinking in that we will be traveling soon. Sorry to hear about your parents. It’s a difficult time fir all involved. Safe travels, dear. Buon viaggi!! Sounds like a great birth month gift. For my 70th (oy) n our 40th anniversary we are going on a clipper ship cruise along SpAins east coast n then Morroco for a camel trek in the Sahara. Should be very interesting!! Hey Barbara, and all this time I was thinking that you were younger than me! Your trip sounds wonderful. I think we will need another PA/NJ ladies lunch to compare notes. I ‘d be very interested in seeing your photos. That sounds great! I love the idea of celebrating ones birth month (although I’ve never been please with my birth month – January). I have a BIG one coming up next year so I guess I should tell my husband to start planning now. I’m sure you will come up with something wonderful, Janis. We just returned from Rome, Florence & Venice with Road Scholar. Enjoy your trip and remember that it can still be hot outside and not very air conditioned inside in Italy! How did you like the RS trip? When we get back, Mike and I will start thinking about 2017. Maybe that will be the year for us to all travel together. 2017 sounds good to us! The RS trip was good, but those Italian cities are very touristy. Glad we were able to see all of the art and architecture. Man O Man – this trip sounds wonderful …. I hope you let go of all the past stresses and enjoy enjoy enjoy! Oh yeah. We are SO ready! Thanks, Janet. I hope the internet connections will allow me to post. Yes, I think an anniversary month is an excellent idea. Next year we will be celelbrating our 40th.